Sarah Vaughan's abilities as a vocalist were evident as a child, singing with a local Newark, New Jersey church choir. In her mid-teens she began appearing at local nightclubs. At 18, entering amateur contests at the Apollo Theater, Vaughan got her break when, by chance, she was heard by Billy Eckstine, who was impressed enough to arrange for an audition with the Earl Hines Band. Due to her immense talent, it is likely Vaughan would have enjoyed some kind of career as a vocalist, but this particular fortuitous circumstance set the stage for the career we know she did have. Vaughan was hired for the Hines band, then followed Eckstine to his own band, then went on to sessions with Dizzy Gillespie and Charlie Parker as be-bop's favorite female vocalist, followed by more than four decades as an international star. Vaughan was equally adept working with large bands and small combos. She could belt out the blues over large horn sections with a confident timing and abandon (on such LPs as Sassy Swings Again), or find a smokey intimacy fronting an acoustic trio (on albums like At Mister Kelly's or Sassy Swings the Tivoli). One could point to any number of individual performances that serve to exemplify her astonishing technique, three octave range and precise unique phrasing. For example, her version of "Lover Man" from the Tivoli (also featured on the fantastic compilation The Mercury Songbook), presents from these qualities an emotional resonance located in the rise and fall of her voice, along the scale and dynamically, marked by gentle nuanced pauses, and backed by strong intuitive contributions from her carefully chosen musicians. Like much of her work, it grabs your attention. This documentary, assembled in 1991 for the television series Masters of American Music, does well to feature a lot of Vaughan's music. Generous selections of concert performances from across her career are the heart of the film, not just background to Vaughan's biography. That story, from her humble beginnings to her death in 1990, is backed up by observations from family and friends. One of the strengths of this production is that the story of, say, Vaughan's discovery can be told to us by Billy Eckstine himself, with a gravel-voiced authority and the kind of telling details available only to those who were actually there. After describing the process of random chance which had him standing in the back of the Apollo Theater in the first place, Eckstine describes what he saw: "She was a little nondescript looking girl and she's seventeen going on eighteen. It was a voice that I hadn't heard, you know. Hard to describe. It was just something that you hadn't heard. Same way an instrumentalist that you hear, (like) Bird, when you hear them the first time." As she was brought into the Hines band, Vaughan had the opportunity to demonstrate that, along with her vocal skills, she also wielded great talents on the piano. This endeared her to her fellow musicians. As Eckstine says: "She came equipped. That's what was so impressive with all the guys… Respect is something that very seldom is bestowed like that." In addition to Eckstine, contemporaries such as Joe Williams, Roy Haynes, and George Gaffney share stories of working with Vaughan, who toured internationally for much of her career, slowing only as the illness that would eventually kill her became more evident (the sense of her passing hangs heavily in the interviews, which were conducted not too long after). The recollections convey a heartfelt respect but, other than Eckstine, do so from a small but discernible degree of distance. So, although the interview subjects can describe her many qualities –- great singer, great musician, fun to be with, tough enough for the road –- the hows and whys seem absent. 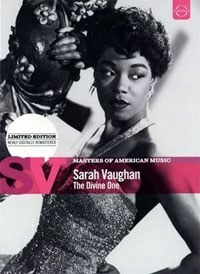 Or, more to the point, Sarah Vaughan herself seems oddly absent. It must have been a dilemma for the filmmakers that their subject, as Joe Williams describes her, was "a very very private person". Though Vaughan was fond of socializing and had great appetite for any number of socializing substances, she apparently preferred to hang with a limited group of close associates and usually in settings removed from the fray, such as a private room or a dark back table at the bar or restaurant. Even her California home, which she shared with her mother and daughter, featured her own separate residence where, we are told, she spent most of her time. Vaughan was married three times, but there is little said about this, with the impression that there was little to actually say. Her professional life dominates her biography. Technically, the documentary is solid. Well chosen archival material is blended seamlessly with the interviews. As mentioned, there is a generous amount of music on offer, with a number of complete, or close to complete, performances. This disc serves as a fine, if slightly underwhelming, introduction to the artist. There are no extra features on the disc, other than a few trailers for other releases in the Masters of American Music collection, which are all of consistent quality.